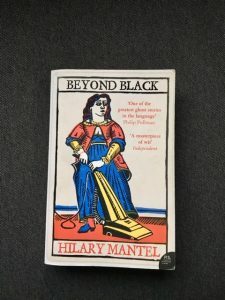 Hilary Mantel, Beyond Black. Harper Perennial paperback, 2005. Travelling: the dank oily days after Christmas. The motorway, its wastes looping London: the margin’s scrub-grass flaring orange in the lights, and the leaves of the poisoned shrubs striped yellow-green like a cantaloupe melon. Four o’clock: light sinking over the orbital road. Teatime in Enfield, night falling in Potter’s Bar. The opening paragraph of this curious novel sounds like Iain Sinclair’s psychogeographical descriptions of the grubby margins of urban life. Not just because of the subject matter – the orbital motorway with its seedy squalor alongside – but the hallucinatory style and tone. The bizarre imagery resembles his, too – or maybe it strays into Angela Carter territory, especially in the sections of seedy occult showmanship. Neither of these tendencies is a bad thing. But I found that 451 pages of grand guignol was a bit hard to stomach. The team at the Backlisted podcast on their Halloween show called this the longest ghost story in English literature . Maybe it is – but it’s too long. The plot, however, is minimal. Alison is an obese medium whose spirit ‘guide’ Morris is a hideous, malevolent ex-circus dwarf. He’s often accompanied by a sickening group of lascivious, vicious thugs who seem to have haunted Alison since her childhood. They slip between the world ‘beyond black’, referred to as ‘spirit world’ by the ‘sensitives’ like Alison, and squat like cut-price demons in the back yards and under the carpets of the living. Much of the narrative consists of nauseous flashbacks to the squalid house she lived in as a child with her mother. Emmie was a prostitute who had tried to abort Alison, and neglected her when her crude attempts failed and the girl starts to grow up. She makes no attempt to care for the child, and sells her on to these vile, vicious creatures without compunction. Alison has constant nightmarish flashbacks to the violence and degradation she was subjected to by this troupe of horrors. These are heightened by being contrasted with the humdrum suburban tedium she inhabits in the ‘real’ world. She acquires a manager/live-in companion. Colette is skinny and spiritually sparse – the reverse of Alison in every way. Their relationship deteriorates as Colette finally has enough of Alison’s bizarrely horrible conversations with people she can’t see. There are flashes of dark humour, and Mantel has great fun sending up the boringly conventional suburbanites who are the two women’s neighbours. 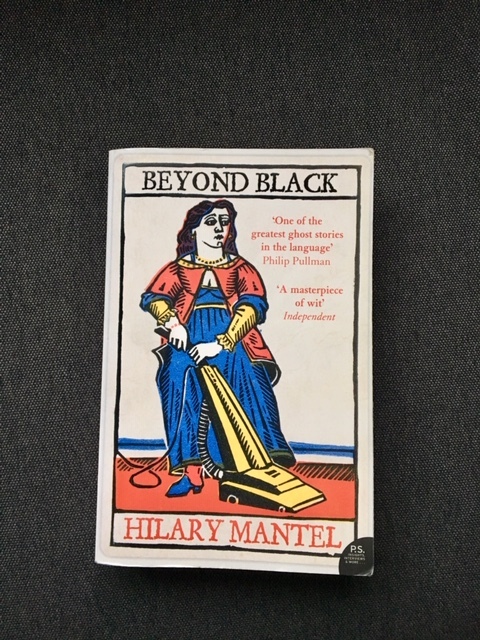 In the PS section of material at the end of the book Hilary Mantel says that she researched the world of stagey mediums and found their ‘demonstrations’ ‘threatening, unlikely, and slightly repulsive’ – and it shows in this novel. I think what prevented me from giving up on this rather nasty story was the conviction with which the author portrays Alison’s haunted world. Alison never seriously tries to convince the sceptical Colette that she really does see dead people, and is no charlatan. Her stage act could easily be a mix of shrewd psychology and suggestion – the punters are mostly credulous and naïve. But the narrative suggests that the nightmare Alison appears to live in is real to her, and her attempts to find out who she is, who her father was, what her true history is (not contaminated memories) is strangely gripping.